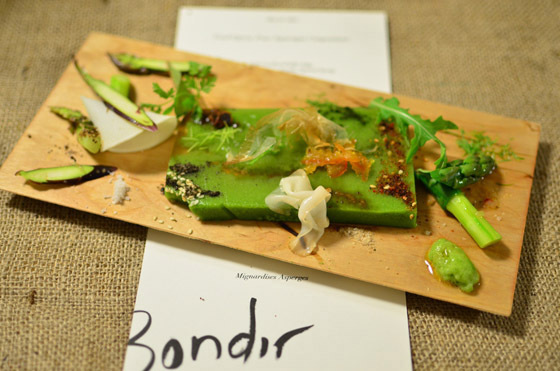 On May 22, 2012, I realized a longstanding dream when I collaborated with local chef Jason Bond (of the widely acclaimed Bondir Restaurant in Cambridge) on a new multimedia composition entitled Food Opera: Four Asparagus Compositions. Chef Bond crafted a four course, asparagus-based tasting menu, and I provided real-time algorithmic accompaniment, responding to cues from diners and servers to score a meal as I would a video game. We premiered our work at the Harvard University Graduate School of Design’s 40K Studio to invited members of the Harvard community, as part of a program curated Jutta Friedrichs, Elisabeth MacWillie, and Sara Hendren, students (at the time) in the new program in Art, Design and the Public Domain. The event was widely acclaimed in such news outlets as NPR, Grub Street, and the Australian Broadcasting Corporation’s First Bite, in addition to this nice write up on Harvard’s site. We’ve just announced a second food opera event entitled Sensing Terroir: A Harvest Food Opera on Tuesday, November 13, this time open to the public, and the complete information for that event (including reservation hotline; seating is pretty limited) is over on the Bondir website. This time around we’re partnering with Artists in Context to tell the story of local farming and sustainable food sourcing, incorporating field recordings and interviews with regional suppliers into the emergent soundscape to investigate dining as a communicative medium. The event is once again being produced by the deft and intrepid Jutta Friedrichs, and Stephan Moore (Merce Cunningham’s former soundman, Issue Project Room curator, and accomplished composer in his own right) will also be supporting with sound design and custom speakers. But before we get into that, I first want to take a moment to pull together some key concepts surrounding this unique project. Friends can testify that I’ve been talking about this idea for years; the first specific conversation I can pinpoint was sometime in 2006. I’ve long appreciated fine food, and somewhere along the line I realized that enjoying a well-crafted meal was an inherently time-based experience, akin to ballet, music, or film, but tailored to the sense of taste. This is true not only in the succession of courses, but in the way a course evolves, as flavors meld, textures break down, and hot and cold converge to room temperature. Even psychologically, our perception of a new dish changes as we become accustomed to it. Once I acknowledged this, the desire to compose music to accompany a meal, just like a dance or film score, followed naturally. This is perhaps the first time in history that it’s been possible to create a customized, responsive sonic food pairing for each individual diner. This is a new genre that has only recently been possible with any degree of refinement, due to the development of responsive digital systems and advancements in speaker technology. At the heart of this endeavor is the goal of respecting the integrity of the ancient social institution of communal dining. This is fundamentally different from the notion of dinner theater, in which some action is taking place away from the table; instead, in a food opera, the plate is the stage. It’s also very different from having a string quartet sitting next to your table, or a violinist or mariachi band wandering through the restaurant. In order to not impinge on the dining experience, the sound must be electronically mediated; the very presence of a live musician distorts the calculus of the meal to an unacceptable degree. Instead, diners are free to talk, uninhibited, just as they would at any other meal. Food opera supports spontaneous interaction. In this way, music is on equal footing with the food. Chef Bond talks about how, in his observation, the awareness and appreciation of food happens intermittently, during pauses in the conversation. In our collaboration, music is not foregrounded, and it should absolutely not distract from the rest of the experience. Instead, it has an ambient quality; to quote Brian Eno, it should be as interesting as it is ignorable. There’s an additional challenge in scoring a meal, one that is different from writing music for film or ballet, but actually quite similar to my work composing video game music over the past sixteen years: the element of indeterminacy. You can’t know in advance how long a diner will take to finish a course, or when the next dish will come. There’s an element of interactivity not only in food consumption rate, but also in the trajectory a diner chooses through the choices on a menu. So the concept from the beginning was to use video game scoring techniques to provide a customized soundtrack for each diner. Here again, the logistical challenges in asking a live performer to provide such nuanced, personalized accompaniment become clear; this experience could not exist without computers and speakers. I feel that one thing taste and sound have in common is that they’re both inherently abstract, unlike a painting or a sculpture. (Perhaps this is why, as I’ve joked with composer friends in the past, the only thing worse than a bad music review is a bad restaurant review; these experiences are hard to distill into words.) Before the advent of recording technology, representational sound was by far the exception (think of the timpani evoking rolling thunder at the end of “Scène aux champs” in Berlioz’ Symphonie fantastique). Most music is about the abstract relationships between pitches and rhythms that add up to melody and harmony, and it’s similarly almost impossible to think of a taste that is about anything other than itself. So in this project, our focus is on perception and experience, not on preconception or association. The last thing I’d want to do is to bring out a sea shanty to evoke seafood, for example, or, I don’t know, a polka to evoke Polish sausage. (This kind of ethnic shorthand is in fact the most widespread kind of food/music pairing, and to me the least interesting.) This is why I sought out a collaborator who eschews traditional dishes in favor of exploring new forms and combinations; it would be much less interesting to compose music for something like a Caesar salad, with which most people already have some kinds of context or expectation. Instead, in the course of our first collaboration, Chef Bond and I realized that many of the same abstract structural notions and terminology apply to cooking as well as to music, and we built on such overlapping concepts as texture, color, density, contrast, pungency, development, and form. For the Harvard show, due to the relatively small scale, servings were fairly synchronized, and all of the activity was mixed down to six channels of sound, spaced along a long, narrow table with about 10 seats on either side. As each new dish was rolled out, there was a gradual crossfade from one dish to the next, as the servers made their way along the table. However for next month, we’re doing something closer to my original conception, which is for each diner to have a unique channel of audio, and for seatings to be unsynchronized, so that different tables are starting and stopping at different times; at any given moment, each table will be at a different point in the overall meal arc. There will be a central computer system that coordinates the music of all tables to a common pulse and key (again, video game techniques to the rescue). It’s a feature of the piece that sound will blend across adjacent tables; the entire restaurant will be transformed into a lush and active soundscape. The plan is to be able to provide diners with a unique recording of their meal after the fact. I did a study back in Shanghai in 2010 with my friend the excellent chef Caroline Steger. We planned a three course meal and invited friends to talk about their impressions. There was scallop with wasabi sabayon, pumpkin soup garnished with lime/cumin-toasted seeds, and asparagus with hollandaise sauce. Based on these conversations, I composed several studies, and one page of music for woodwind trio wound up in last May’s event. I basically analyzed the page I had written, then wrote an algorithm to generate endless variations of it. Other sections used different generative, procedural, or algorithmic techniques, continuing indefinitely while avoiding repetition (a key concern in video game composition). There’s been a lot of recent interest in the overlap of food and the more traditional arts (or perhaps I should say, those arts that are more traditionally considered arts). Just a few examples off the top of my head include the Science and Cooking series at Harvard (through which I first met Chef Bond), Ferran Adrià’s opening El Bulli to guests at Documenta 12, Marina Abramović’s Volcano Flambé (in which her soothing voiceover accompaniment, delivered via iPod, described the textures of the dessert [“crunchy, creamy, cold…”], and which I got to taste at Park Avenue Winter last year, and which may have made me ill), Heston Blumenthal’s Sound of the Sea (also featuring iPod accompaniment), and Paul Pairet’s multimedia tour de force Ultraviolet, which I got to check out when I was back in Shanghai last summer (it was amazing, and I have lots to say about it, but perhaps we should save that for another time). I feel like what we’re doing is part of a larger movement that is reevaluating the aesthetic potential of taste. Here’s Jutta’s video, documenting the first food opera! Food Opera – Four Asparagus Compositions from Jutta Friedrichs on Vimeo. So to bring us back to the present, the next food opera happens on Tuesday, November 13, at Bondir in Cambridge. It’s a five course $125 prix fixe menu with drink pairings. That figure is not out of line for either a five course meal at a fine restaurant or an opera ticket, so you can think of it as two for the price of one! In case you’re still not sold on this liberal conception of opera, it seems fitting to close with a link to an article entitled “The New Opera,” written by Gavin Borchert almost 10 years ago in the Seattle Weekly, in which he likens video game development to the early days of opera, with composers “exploring untested ways of combining music, story, and visual spectacle.” Sounds about right!